Uncategories WHAT IS REACT AND WHY USE REACT? WHAT IS REACT AND WHY USE REACT? Have you ever imagined, in addition to the huge infrastructure, what framework is used by the giant sites like Facebook on the interface, so that even if used by billions of people, either from PC Desktop or Smartphone but still can handle and look at least not fatigue to serve the demand billiard it? Because they use a library that is designed for it, its name is React. The purpose of React is to solve one major problem: building large-scale applications with data that always change over time. 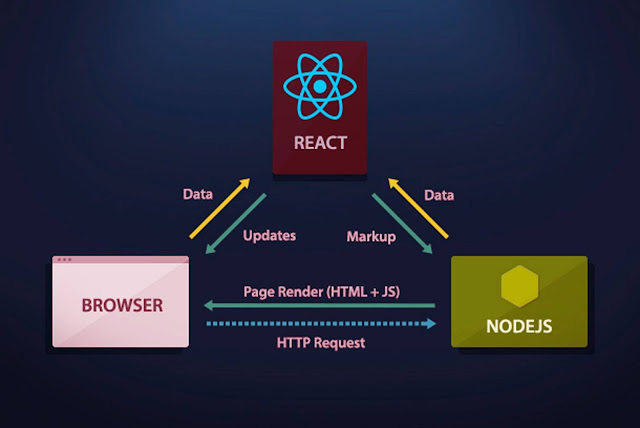 The rough language, just reveal how your application should be visible at a time, and React will automatically manage all updates of the user interface (UI) when the underlying data changes. When there is data that changes, Reach conceptually presses the "refresh" button, and he knows the part that needs to be updated is only the part whose data changes. Using React is about how we create components that can be used repeatedly. In fact, with React the only thing we do is make the components. And since these components are highly encapsulated, the components that have been made, making use of once-written code that can be used repeatedly, then testing, until the separation of the program parts becomes very easy.